Generally we recommend sending save the dates for meaningful events. It is important to inform business partners, customers or employees of the upcoming event early so they can plan their time. 2-4 months in advance is what we see most at EventKingdom. Some customers send save the dates 6 months in advance though. It depends heavily on the occasion. Finding the right design that matches your company and event is also important. 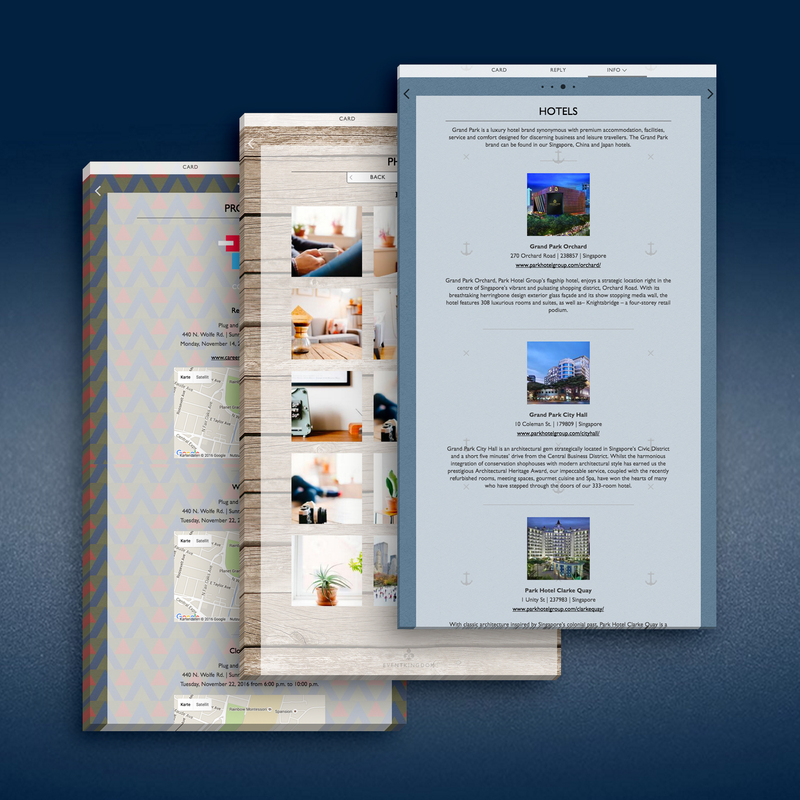 Further below under invitations we go into more detail about our design options. Matching save the date and invitation designs are considered professional, but are not a must. An often used function for save the dates is the collection of postal addresses for later paper invitations. All addresses are neatly saved in your recipient list and can be easily exported and e.g. used to print your envelopes when ordering paper cards and envelopes via EventKingdom. We can gladly recommend our paper card collection for corporate invitations. Customers also often use the extra page options on reply page and show travel info, hotel info or e.g. assistant contact details. TIP: Many customers ask us if one can request RSVPs when sending a save the date. This is technically possible and many customers do this. We though do not recommend it. The term “save the date” speaks for itself. Your guests should save the date. They will let you know if they can attend after they received their invitation. To plan your event it is best to get an estimate of the attending guests asap. We therefore recommend sending your invitations 1 to 2 months in advance. Paper invitations are generally sent earlier than online invitations. 1. You can choose your favorite design from collections by well respected international designers and illustrators or special company card templates. 3. You ask us to design for you. 1. Send online post: You can send online post invitations and benefit from many special online features and the included recipient monitoring and reply & guest management. 2. Order paper cards: Here you can benefit from many beautiful paper choices and high quality printing. You can book our send4you service or order your cards and send them yourself. Both options can be used separately or in combination. 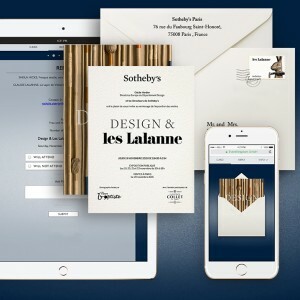 The combined service of sending paper invitations with an online connection is becoming more and more popular. The benefits of online include reply management and all needed event infos for your guests, such as travel infos, accomodation, agenda, photos etc. Many customers print a URL like www.corporateexample.com on their paper cards. The URL can be open or secured with a password. It is also possible to add a personal code to recognize guests when they visit your online event, which is helpful for addressing them or if you are managing different guest lists for each event. All online sendings and paper/online combined events include a free app. 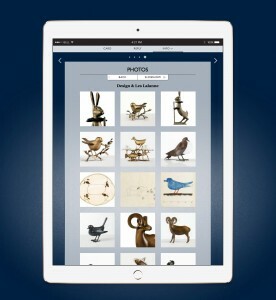 Your guests can access the app on their iphones easily. They have acccess to your invitation and all the info pages on the reply page whenever they need it. The day of “Shoot, I forgot the invitation” are over! Every online or combined paper/online sending includes an event website for free. Various helpful pages, e.g. program, agenda, hotels, contact, photos, downloads etc. can be added on the reply page of an event. This allows you to add all needed information for your invitation in one place. Your guests have access to this info all the time and can therefore plan their trip with ease. 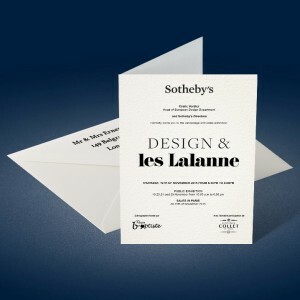 Many corporate customers want to send paper invitations. You can design one card and choose to send it online, via paper or both. For paper we offer different types of beautiful paper and high quality printing. In addition to our standard paper product with various formats and single or folded cards, customers can ask us to organize special paper and/or printing methods. Such requests are best discussed in a call. Samples of paper cards can be ordered at any time and as often as needed. This is helpful so you can make sure you are satisfied with the quality of the paper and print. You are planning an event and are searching for an online alternative to classic paper invitations? Then you have come to the right place! This was exactly the founding idea of EventKingdom. EventKingdom online post offers you every possibility to make your online invitation just as personal and chic as a paper invitation. Additionally many features like one click reply options or accompany and contact info management make online post by EventKingdom easier than email. Additionally special online features, such as an animated envelope with your own stamp and lining, colorful backgrounds or music integration can spice up your online invitation making it even more impressive than the paper version. If you want you can also add a wax seal or a prioritaire sticker to your envelope. You can also include the free photo page into your invitation so your guests can e.g. get a feel of the event location before they reply. Many events consist of multiple invitations, e.g. a fashion fair on 3 different days, a Theater with 3 different premiere showings or a vernisage with following private dinner invitation. 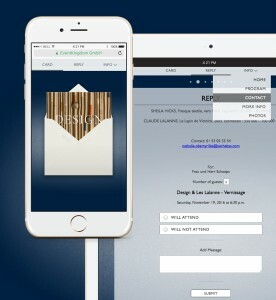 At EventKingdom you can include multiple invitations in one sending – similar to a classic envelope. This not only saves your time and money, but also makes it easier for your guests to reply. If you wish to view a live example, please click the example image or here. In case your event has different guest lists, e.g. 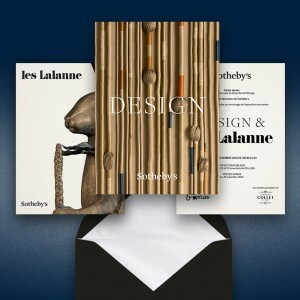 a larger list for the vernissage and a more exquisite one for the dinner invitation, this is also possible. On the EventKingdom recipient list you can manage each invitation per recipient. Each recipient therefore only receives the invitations he is supposed to receive. TIP: We recommend sending a reminder roughly 2 weeks before the RSVP date. (If you chose to use the RSVP date feature.) Otherwise sending reminders is a matter of taste and depends heavily on the event. You will most likely be needing various paper products (among other things) for your event, e.g. 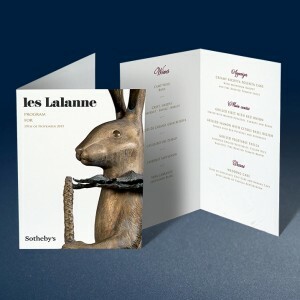 menu cards, table cards, programs etc. EventKingdom paper service offers all these products. We can gladly assist if you need the same design for your different paper products. 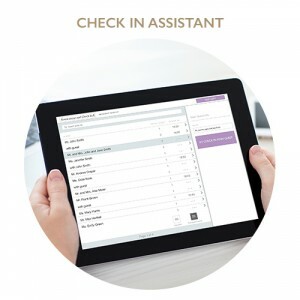 Benefit from EventKingdom’s CheckIn assistant, which can be used easily on multiple devices and for unlimited guests. Visit our Check in post to view photos and videos of Live Events. Benefit from having your checked in guest list, which can be used to create new events or for sending thank you letters or sharing photos via the photo page. So, before you are off or back to work, you might want to share the event highlights with your guests. You can do this easily by using the EventKingdom photo page, which you can add to your reply page. Here you can create albums, upload and share photos, either with all guests or just the ones, who accepted. You can view a real photo page example here. Sending beautiful thank you cards is a recommended way to close the event cycle. If you choose to send online post then we can gladly recommend our online post thank you card collection. A helpful feature when using online post is to copy over the accepted guests into a new event. This makes sending an online thank you card quick and easy. TIP: Many customers add event photos to their thank you card online sending. This gives your thank you card a personal note and also means that you don’t need to send two emails to your guests. We can gladly assist if you wish to use the same design for your thank you card as you used for your save the date or invitation. That’s it for now! Thank you for reading our post. We hope we gave you some interesting ideas and that you are satisfied with our product www.eventkingdom.com and our services! This entry was posted in Uncategorized and tagged event planning on April 27, 2016 by eventkingdom.